We wrap and dispatch every week day from our little MooGoo outpost in California and never head from home until all orders are done. We usually send via USPS and this can take between 1 and 7 days to arrive, depending on your location. If you want a little MooGoo, a little Dusty Girls or Dr Zoo, you can switch between websites and only pay one lot of shipping for the whole order. That’s some internet magic that only our web guy understand. Shipping cost is only $ 6.50 for everything delivered in the USA. International rates apply for other Countries. We are sure you will enjoy. 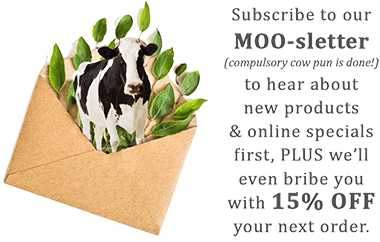 Feel free to email us at concernedcow@moogoousa.com if you have any questions. MooGoo has a 100% customer satisfaction policy. If you are not satisfied with a product(s) you have purchased online, we will happily organise a refund or exchange. Simply email us explaining whether you want a refund or exchange for the product(s) and a reason for the return or exchange. This should be done within 60 days of receipt and the product(s) must be substantially unused. When returning goods, please keep proof of return in the event the parcel goes missing in transit.